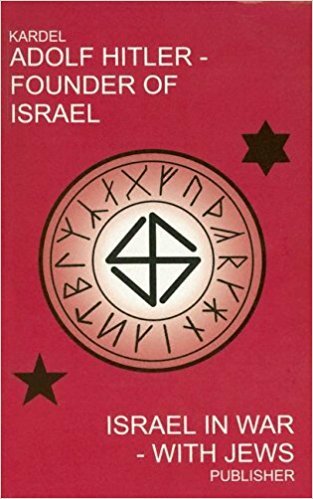 I have read the very controversial and hard to „swallow” „Adolf Hitler – Founder of Israel: Israel in War With Jews”, and despite its seemingly offensive title, I strongly recommend this book. Foremost, I recommend this book to the Holocaust survivors and their families who seek the peace of mind about the horrors of the past and why they happened to them and their loved ones. Next, I recommend this book to all those who seek the truth (Kardel’s motivating factor for writing it in the first place), and to all others who wonder why World War II has never ended but still 55 years later rages on in the Middle East and elsewhere. And most importantly, why in the process so many millions of us and even more of others have perished and continue to perish. 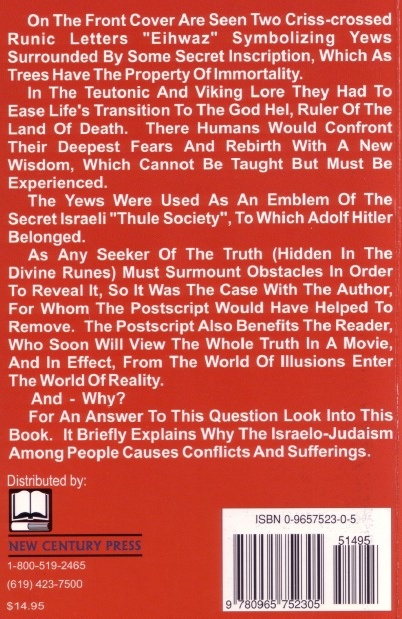 In other words, borrowing from the book’s subtitle, why ever since its inception thousands of years ago Israel has been in War with Jews and the rest of Humanity. („Le Contrat de Transfert” / „The Transfer Agreement” / „Heskem Haavara”, par Edwin Black; Channel 5 News/USA, 1984) : Adolf Hitler a été „le principal sponsor économique de l’Etat d’Israël” „Le Contrat de Transfert” (The Transfer Agreement) dès 1933. Edwin Black, Juif américain dont les parents sont des „Survivants de l’Holocauste” ont émigré aux USA après la fin de la guerre, raconte l’histoire d’un pacte secret conclu en Août 1933 entre l’Etat nazi et les Juifs zionists allemands et internationaux pour rendre possible le transfert de capitaux, de Juifs et de produits industriels en Palestine britannique entre 1933 et 1939. Heskem Haavara/הסכם העברה (HE); Ha’avara-Abkommen (DE); Haavara Agreement (EN); l’ Accord Haavara (FR). The Rothschilds were very clever; by making agreements with both sides, they ensured that whatever else happened, and whoever ‚won’ their phony war, Israel would be imposed upon the middle-east… and the world has been paying for it ever since! From Jim Condit Jr.’s DVD The Final Solution To Adolph Hitler (2002). 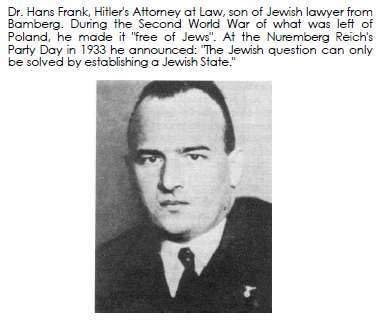 On Zionist-Nazi Collaboration, Adolf Hitler’s Treason, Ignaz Trebitsch-Lincoln aka Moses Pinkeles, Paul von Hindenburg, Otto Strasser, Anti-Semitism as a tool to advance the Jewish Agenda, Israel Shahak, Frank Collin Jewish Neo-Nazi in Skokie Illinois, and more. 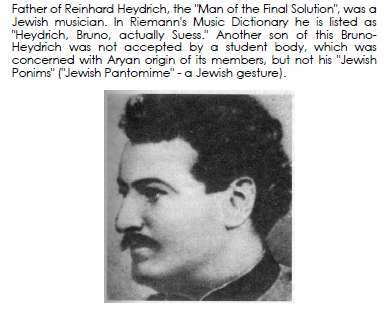 The forbidden question Was Adolf Hitler really Jewish? 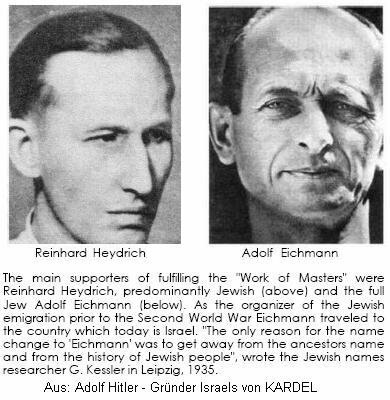 REVIEW: Adolf Hitler: Founder of Israel, by Hennecke Kardel, Marva, Switzerland, 1974. 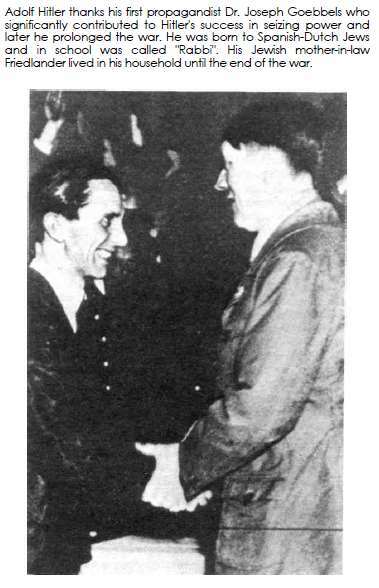 Anyone who does not want to know in detail about Hitler’s half Jewish „alcoholic” father, whom he dragged home from the „ugly, shameful, stinky and smoky bars”, (6) and who does not want to know about Hitler’s endlessly psychotic hatred toward his kinsmen, will understand little about history of the twentieth century, about the creation of the State of Israel, and about oncoming events which will make us hold our breaths . . .
“After one and a half centuries it is very unlikely for anyone to be able to prove that the Jew Frankenberger was Hitler’s grandfather on his father’s side,” writes Hennecke Kardel, former infantryman of the Third Reich who later lived in Switzerland. 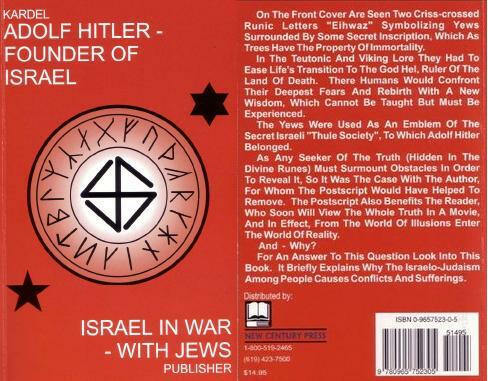 So goes Kardel’s “Adolf Hitler: Founder of Israel,” perhaps the most vilified book by both Jews and non-Jews that is available on the Internet. It won’t take you long to discover Kardel has written an intimate history full of verifiable historical data. Whether his conclusions are correct are something you should decide for yourself. Kardel (1922-2007), was the son of German scientist Rudolf Kardel. After completing Army academy he served as an infantryman in the German army in Russia and the Balkans. That’s Hitler, Hess, Goering, Goebbels, Frank, Himmler, Heydrich . . . the entire top of the Nazi hierarchy was Jewish. That to me is a far more interesting fact than the now-proven fact that Adolf Hitler’s grandfather was a Jew, who fathered the man who fathered Hitler out of wedlock. The entire top of the Nazi hierarchy was Jewish! Wow! What does that really mean? In a paragraph that offended many old friends, I recently wrote that World War II could be looked at in the following way: three Jewish controlled countries, the United States, Britain and the Soviet Union, all ganged up on the one country in the world, Germany, that openly talked about the Jewish danger. And the Jewish powers crushed Germany, are still crushing it. But what if I was wrong? What if it was all four countries were secret Jewish operations. Roosevelt, Jewish on both sides, run by Baruch, Morgenthau and Rockefeller. Churchill, Jewish on his mother’s, surrounded by the Rothschild bankers in the City of London. Stalin, Jewish mother surrounded by thousands of Bolshevik Jews. And now Hitler, and all his top brass: Hess, Himmler, Heydrich, Goering, Goebbels . . . all Jewish. Suddenly the sky is darker in the world. Something has blinded us. And now we know, with the hundreds of millions dead in all these cynical Jewish financial machinations, the prison in which we are trapped is much, much darker than we can even conceive. Be afraid. The American denouement is at hand, and it is Jewish. Human history is thoroughly stained with the blood shed by these Jewish scams. It’s time people realized it, and did something about it, fast. They’re own blood is about to flow. I was afraid to read this book for a long time. Initially, Kardel’s contention seemed preposterous. But then I wanted to read it to discern it wasn’t just another Jewish scam, meant to confuse people. The only hint of Jewish subterfuge I could discern is Kardel’s frequent use of the word extermination, and the inference that gassings took place. Thus it could be that Kardel wrote this fantastic scenario to lend credence to the phony gas chamber story. There is no existing documentation, other than fraudulent Jewish hysteria, to ever show the Germans gassed anyone. Professor Robert Faurisson of France has been asking for 50 years (yes, fifty) for a drawing or photo of the gas chambers at Auschwitz. Though he has been beaten repeatedly by Jewish street thugs, and harassed by the Jewish-controlled French courts for decades, no drawing or photo of the alleged Auschwitz gas chamber has ever been furnished to him, despite the massive propaganda machine that promotes the Holocaust. The limits to which Jews have gone to describe their alleged horrors, epitomized by Elie Wiesel’s entirely falsified account titled ‘Night’, which inexplicably was awarded a Nobel Prize (indicating the award was now totally Jewish), are legendary. It is my judgment that Kardel wrote this straight up, because he knew the story and found it compelling. I don’t see what advantage the Jews would gain by revealing Hitler’s Jewish heritage, except that it casts further light on the workings of the Jewish financial octopus that controls the world. The Germans could be excoriated for letting this Jewish menace take control of its own Fatherland. But it seems clear that the United States is now in the same sinking boat. Among the many interesting nuggets of history in Kardel’s book is this one. Get this! The Nuremberg prosecutors, all Jewish, deemed the six million myth too ludicrous to even be considered in the prosecution of Nazi war leaders. And today in most Jewish controlled countries, it is a crime punishable by jail and financial ruination to dispute the figure of six million. Do you still think that Jews don’t control the world, and are not about to steal everything you own and won’t take your life along with it? If you read The New York Times or listen to CNN, you do. Just ask Judith Miller or Wolf Blitzer, both Jews. These Jews are not who they pretend to be. But what Jew is? This introductory edition was translated by the Publisher, Modjeskis’ Society Dedicated to Preservation of Cultures, P.O. Box 193, San Diego, CA 92038, © Copyright 1997 Modjeskis’ Society ISBN 09657523-0-5 and is also available for distribution under the address of this Society. “Those who were considered Western Jews were sent by Eichmann’s men to the Theresienstadt, which didn’t look like a concentration camp, nor a hungry Jewish city, for it had its own administration, schools and cultural establishments. Many times the gentlemen of the SS-Imperium, who always were moneyhungry, made splendid business deals with its Jewish „citizens”. These secret dealings made the SS Chief Leader General Kaltenbrunner furious and about this he testified in Nuremberg: „Himmler did the worst things through Becher which should be revealed here. 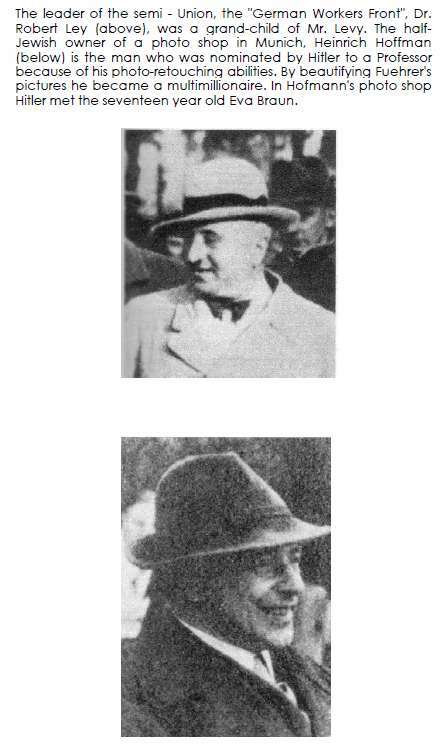 They consisted of letting the Jews go free after mediation by Becher and the Joint Committee in Hungary and then in Switzerland, firstly in exchange for warfare materials; secondly in exchange for raw materials, and thirdly in exchange for foreign currency. I heard about these deals in the News Center and expressed my opinion immediately, but not to Himmler, because it would have been hopeless, but directly to Hitler.” There was no question about the fact, that throughout the whole war the armament and foreign currency came to the Reich via Switzerland. So Himmler, a Jew, let certain Jews buy their way out of the posh concentration camp for favored Jews. Sounds like Bernie Madoff, eh? One thing about Jews is they don’t mind ripping each other off. And that will be their undoing. and in Poland is already sold out. for distribution under the address of this Society. This entry was posted in Dzieje, Genetyka, Nauka o człowieku, Stara nauka, Tradycje i kultury, Zakazana Wiedza, Ściemy na masę, Życzenia pobożne and tagged #GermanDeathCamps, #JewishCollaborationWithNaziGermany, #JewishNaziCollaborators, #PolishHolocaust, #PolishHolokaust, 13 Leszno, 13 Leszno Street in Warsaw, 25 August 1933, Abraham Gancwajch, Adam Czerniakow, Adolf Hitler, Adolf Hitler – Founder of Israel: Israel in War – With Jews, agreement between Nazi Germany and Zionist German Jews, Anglo-Palestine Bank, Ans van Dijk, ANTI-SEMITISM BY POLITICAL ZIONISM, Auschwitz, ‎ Rachel Neiman, Bernard Goldstein, Birkenau, British Mandatory Palestine, Central Office of the Jewish Council of Elders in East Upper Silesia, Chaim Rumkowski, Chełmno extermination camp, Collaboration with Occupying Forces and Genocide in the Second Republic 1918-1947, David Gutter, David M. Crowe, denial, double ethics, double morality, double standards, Edwin Black, Eichmann in Jerusalem, Eliezer Hoofein, Elsa Trank, Else Tarnek, Enemies Within Our Camp- The Trial of a Kapo, Five Years in the Warsaw Ghetto: The Stars Bear Witness, Genocide, German, German Gestapo, German invasion of Poland in September 1939, German Jewish, German National People's Party, German occupied territories, ghettos in Nazi-occupied Europe, Give Me Your Children, Gomberg map, Greatest Hoax Ever Perpetrated On The Jewish People, Gross-Rosen concentration camp, Gross-Rosen concentration camp in Germany, Group 13, Group Thirteen, Guttman Shmuel Landau, Haaretz, Haavara Agreement, Hannah Arendt, Hanotea, Hashomer Hatzair, Hennecke Kardel, HItler, Holocaust, Holocaust Industry, Holocaust scholar, http://jewishcrimes.info, http://www.jewsnotzionists.org, https://www.haaretz.com, Hungary, Ignacy Diamond, II World War, Itamar Levin, Jacob Gens, Jakub Lejkin, Józef Andrzej Szeryński, Jewish Agency, Jewish Aid and Rescue Committee in Budapest, Jewish collaboration with Nazis Germany, Jewish collaboration with Nazis Germany during II World War, Jewish Community of Vienna, Jewish council, Jewish ethics, Jewish Gestapo, Jewish Ghetto Police, Jewish ghettos in German-occupied Poland, Jewish Holocaust Amnesia, Jewish honor, Jewish kapos, Jewish Nazi collaborators, Jewish self-agency, Jewish Sonderkommando, Jews Accusing Jews, Jews Against Zionism, Jews were put on trial in Israel for aiding the Nazis, Josef Löwenherz, Josef Szynkman, Judenrat, Kapo on Allenby, kapos, Katarzyna Person, Kurt Becher, Leon Rosenblatt, Litzmannstadt, Litzmannstadt Ghetto, Man’s Search for Meaning, Marcel Zellinger, Mordechai Chaim Rumkowski, Mordechai Goldstein, Moshe Merin, Moshe Pochich, Nazi and Nazi Collaborators (Punishment) Law, Nazi and Nazi Collaborators Law, Nazi collaborator in the Warsaw Ghetto, Nazi concentration camps for Poles in Silesia, Nazi German administration, Nazi-imposed Jewish councils, Nazi-imposed Judenrat, Norman G. Finkelstein, NSDAP, Ofer Aderet, One cow in Palestine is worth more than all the Jews in Europe, One cow in Palestine is worth more than all the Jews in Poland, Oskar Schindler: The Untold Account of His Life Wartime Activities and the True Story Behind the List, Ostrovitz ghetto, Palästina Treuhandstelle, Poland, Poland’s Holocaust: Ethnic Strife, Poles, Polish citizens, Primo Levi, Rabbi Weissmandel, Restoring ‘Jewish honor’, Revisionist Zionist, Reya Hanes, Rudolf Kastner, Schindler’s Ark, Schindler’s List, Shoah, smuggling furs out of the Warsaw Ghetto, Sonderkommando, Stella Kubler, Symche Spira, Szlojme Hercberg, Szymon Spitz, Tadeusz Piotrowski, Talmudic ethics, The Drowned and the Saved, The Holocaust Industry: Reflections on the Exploitation of Jewish Suffering, The Nazi collaborator who served ice cream in Tel Aviv, The Transfer Agreement, The Trust and Transfer Office "Haavara" Ltd, Thomas Keneally, Tzvi Yaakovson, Viktor Frankl, Vladimir Jabotinsky, Walls Around: The Plunder of Warsaw Jewry during World War II and Its Aftermath, Warsaw Ghetto, Wehrmacht, Weronika Grynberg, Wiera Gran Vera, Wladyslaw Szpilman, World War II, World Zionist Congress, Yaakov Honigman, Yechezkel Ingster, Yehezkel Ingster, Yitzchak Gruenbaum, Ze'ev Jabotinsky, Zentrale der Jüdische Ältestenräte Ostoberschlesien, Zionism, Zionism And Anti-Semitism, Zionist Federation of Germany by SKRiBHa. Bookmark the permalink.